Summary: The struggle to get into a top-tier college consumes sixteen-year-old Genie Lo’s every waking thought. But when her sleepy Bay Area town comes under siege from hell-spawn straight out of Chinese folklore, her priorities are suddenly and forcefully rearranged. Review: Way back in 2016 (feels like a millenia ago, huh? ), this tweet by Zen Cho about a new book came across my dash. And because I’m easily persuadable, I was immediately on board. The bit about the heroine becoming powerful enough to “break through the gates of Heaven with her fists” was my jam. Imagine how psyched I was when, over a year later, the book came out and I saw mentions of the monkey king. Sun Wukong in YA lit? Hell yes. Get me some toast, because this was even more my jam. I know I say this a lot, but this book did not disappoint. The heroine Genie Lo is a super motivated elite SF prep student with her eyes on nothing but the prize – Ivy League glory and a better life. When new kid on the block Quentin Sun shows up and tell her that she’s really someone straight out of Chinese mythology, she has to step up to bat to defend the people she loves against a host of monsters. Genie’s character – cynical, motivated, yet unwaveringly protective of her friends and family – is what drives the story and kept me reading through the night. And it was awesome to see how she clashed and then worked with Quentin. Speaking of Quentin… I’m not going to spoil anything. But, also, that reveal of who Genie was? I laughed, then had to take a reading break while I digested what had happened. That was amazing. Basically, this is a must-read for everyone. But if you’re Chinese American (or, like me, Taiwanese American), this is a next level absolutely-no-excuses-must-read. There were so many moments that I knew all too well — like the relief of seeing your mom get to have a meaningful conversation with someone else in Chinese and be happy. Not only that, I’m from the Bay Area and attended a super competitive, majority (86%!) Asian school growing up. What Genie was going through was a hauntingly familiar creature. Now I’m just rambling. 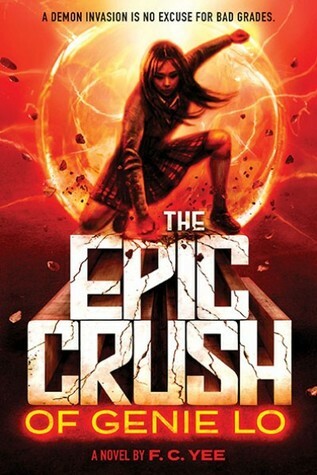 Look, just put The Epic Crush of Genie Lo on your reading list. You’ll love it, I promise you. And if there’s going to be a sequel, someone tell me ASAP.